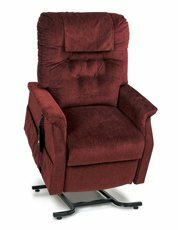 Which lift chair is best for you? 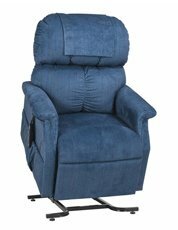 The two way chair is a recliner that can be used in two positions: upright and reclined. The upright position places the chair back at a 90-degree angle with the floor. The reclined position places the chair back at approximately a 45-degree angle to the floor and an extending footrest comes out to hold the legs parallel to the floor. 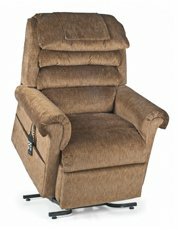 The three way recliner has the first two positions, and an additional fully reclined position. Also known as the “napping” position, this third option allows the user to kick back for a nap. The chair back is at approximately a 30-degree angle to the floor with the footrest still holding the user’s legs parallel to the floor. The infinite position chair allows the user a full range of reclining positions. It can fully recline into a true sleeping position for those users who have trouble getting into a bed, or just serve as a bed for guests. The infinite position is more comfortable than a fully reclined position, it also straightens out the user's legs and back. 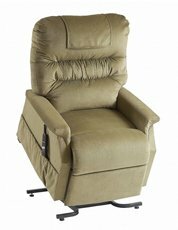 The gravity lift chairs offer the wide range of positions available in an infinite lift chair. These chairs also extend even further backwards, angling the chair back towards the floor. This is considered to be very helpful for those with back problems. The chair is designed to reduce all strain on the back, while still fully supporting the body.